Helps support cognitive health and brain function. 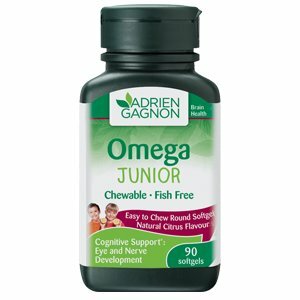 Helps support the development of the brain, eyes and nerves in children. Source of Omega-3 fatty acid for the maintenance of good health. Source of DHA for the maintenance of good health. DHA is an essential fatty acid necessasry for the proper and normal development of the brain, the eyes and the nerves. DHA is indeed found in high levls in the brain. A sufficient daily intake of DHA is necessary to support an optimal brain development, as well retina and nerve development. Safflower oil is a natural source of linoleic acid, an essential omega-6 fatty acid in children. Preliminary studies have shown that a deficiency in omega-3 and omega-6 fatty acids in children is associated with a higher risk of attention deficit or hyperactive behavior (ADHD).